It’s a small, square, orange piece of paper. But it can change your life. Six numbers that’s all it takes. Possible? Yes. There are people out there that have done it. Bastards. Probable … not so much. 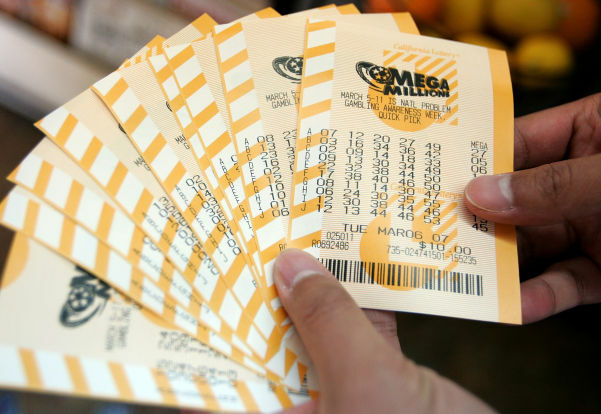 The state lottery was up to 363 million dollars. Did I buy I ticket? But having that small slip of orange paper, made me think of my dad. He wasn’t a compulsive gambler or big purchaser of Lotto, but whenever it was up there he would buy a couple of tickets. I remember telling him I needed one of his business cards for something and he told me to get it from his wallet — some leather thing he had since 1987 that was holding on to dear life by a thin brown thread. No matter how many wallets I bought him, they remained in their boxes and my dad held on to his aging money carrier. As I looked through the wallet, I found a couple of pictures of my sister: One from her junior prom as the reigning queen; One from homecoming as the reigning queen; A glamour shot with a big, red, fluffy, feathery scarf deal and soft lighting happening. She’s in her late thirties and my dad still carried all these old school photos of her. Grandkids? A couple of each kid, smiling that cheesy smile that preschoolers know how to master. As I continued flipping through his wallet and looking at all the business cards I found a couple of lottery tickets and for some reason that made me sad. I always thought I’d be some big time writer so my dad wouldn’t have to buy lottery tickets. My dream was to repeat the Citi Credit Card commercial with the father and his son going to the land of their ancestors. Have you seen it? Yeah I wanted to repeat that version with my dad when he turned sixty, but it never happened. Instead I found state lottery tickets in his sad wallet. Made me feel pretty crappy. He asked why I looked weird. I explained to him that I wanted to take him to Spain with my big time writer best-seller book advances or my hit TV drama royalties when he turned sixty. Instead I just bought him a steak dinner and baked him a cake. “That cake was good,” he said. He’d smile and shake his head. I never got that chance to be the Guat version of the Citi Credit Card commercial. It’s almost going to be two years since he passed. He was 62. I had three years left. So when ever I see those old, orange lottery tickets folded up in my wallet, I think of my dad, my writer’s dream, and Spain. Beautiful story. I think you should still go to Spain and have some paella and tortilla española – your dad would have wanted you to enjoy that.